As part of the Administration’s ongoing efforts to fight human trafficking, and in recognition of National Slavery and Human Trafficking Prevention Month, the White House releases the first-ever Federal Strategic Action Plan on Services for Victims of Human Trafficking in the United States. Last year, President Obama articulated an ambitious and multifaceted agenda to combat human trafficking in his speech at the Clinton Global Initiative. This week, the Administration took two important steps to advance that agenda. On August 15, the Department of Homeland Security (DHS) released new resources to protect immigrant victims of human trafficking, domestic violence, sexual assault, and other serious crimes. 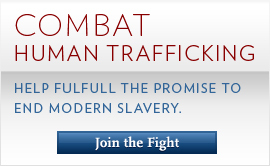 Today, the Department of Homeland Security launched a redesigned Blue Campaign to combat human trafficking.